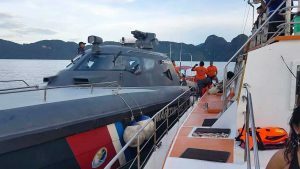 Langkawi (Malaysia) – October 19, 2018 (travelindex.com) – The past few months, APMM has been boarding and checking yacht operators doing Day and Sunset cruises..their operations caused a major drop in tourists wanting to do these tourist activity that showcases the beautiful sea n sunsets of Langkawi. The manner they board and check boats carrying tourists scares and frightens tourists and many have complained to the operators and travel agents. It became so bad that the Director General of Jab Laut had a dialog here on the 10th of Oct..he understood our problems and also suggested to APMM to have a more tourists friendly SOP while boarding tourists boats. With regards to to licensing and commercial operations he made clear this could go on n all licensed n registered boats under commercial can continue to do so until a proper SOP was formulated by Jab Laut and requested APMM officers present to stand down on LIYR registered boats. Sad to say, APMM has not heeded this advise n request although they were present and continue harassing the boat operators and jet ski operators. They have abused their authority and use their all powerful act to harass n bully local operators for reasons best known to themselves. The APMM act was to protect us from piracy, drugs, criminal acts spying and such..but being so powerful its putting fear into normal people and esp operators as they seize vessels on suspicion and take their own time to conduct investigations..while operators are daily losing money and cancelling bookings..what about staff salaries and expenses whilst they conduct their investigations. We as an association have tried speaking or having dialog with them but they refer us back to Jab Laut..but when Jab Laut requests them to stand down..they don’t follow..they act like masters of the sea and lord over all of us..they seem to forget we are normal rakyat doing our best to bring it tourists revenue for the federal n state government.. this bullying and harassment must stop..APMM cannot be allowed to continue to do this..they are destroying the image of Langkawi. This is how they scare n frighten tourists as well as our local youth working on board..bullying using their big gun boat against tourist boats..while pirate issue few weeks ago they never responded to pleas for help from our local fisherman and luckily marine police responded and arrested the pirates..guess APMM was to busy harassing local tourists boats and jet skis. We suspect that they are trying to prove their relevancy to our PM who is the member of Parliament of Langkawi, after our PM questioned their relevancy in a speech few months ago.. but our suspicious is just suspicious..we dont have an act of parliament to allow us to do anything. Never before APMM officers have been so anti tourism. The former Panglima in charge of Langkawi had a very tourism friendly SOP for checking tourist boats without scaring tourists off..but now..now we have no choice but to appeal to our PM, who is the member of parliament for Langkawi, all the members of parliament and AG’s Chambers to revisit the APMM Act and its usage against local tourism boat operators.